The University of South Florida&apos;s College of Arts and the USF Contemporary Art Museum (USFCAM) is pleased to present Teresita Fernandez: Blind Landscape, August 17 through October 10 . Teresita Fernandez is internationally known for her immersive installations and evocative large-scale sculptures that address space, light, and perception of change. This exciting exhibition is curated by USF Institute of Research in Art Chief Curator, David Louis Norr and will present a spectrum of the artist&apos;s most recent and ambitious projects, including a new sculpture and a room sized installation created specifically for this exhibition. Following its tampa debut, the exhibition will travel to the Blanton Museum of Art in Austin, Texas, from November 1 through the end of 2009. 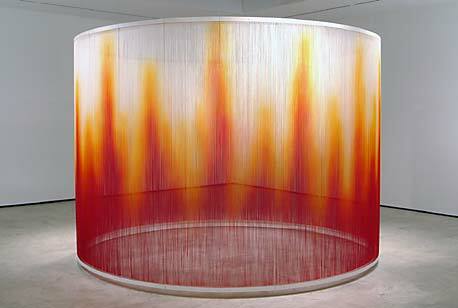 Teresita Fernandez, one of the most accomplished artists of her generation, is recognized for her deft ability to transform common materials and processes, such as bamboo, into dazzling cinematic illusions... while blending abstraction, reflection, and transparency into configurations of projection and play. Fernandez, recipient of a number of arts fellowship awards/recognitions is also a Florida native, born in Miami. USFCAM is open Monday through Friday 10AM to 5PM and Saturdays from 1PM to 4PM... Admission to the Musuem and this event is FREE; however parking is $4. I would suggest taking advantage of the opportunity to learn more about arts and culture in Tampa Bay... Tampa Bay events like this don&apos;t happen every day! For more information or questions contact Alexa Favata via email at favata@arts.usf.edu.